cranberries, originally uploaded by shaunaforce. I know  it’s the day before Thanksgiving. In fact, as I type this, it’s after 11 pm the night before Thanksgiving. You have probably already made your cranberry sauce. In fact, some of you may have given in to temptation and bought those terrible cans of cranberry sauce, the stuff that comes out with the rings of the metal tin embedded in the sides. Ay god, that stuff is awful, once you have tasted real cranberrry chutney. 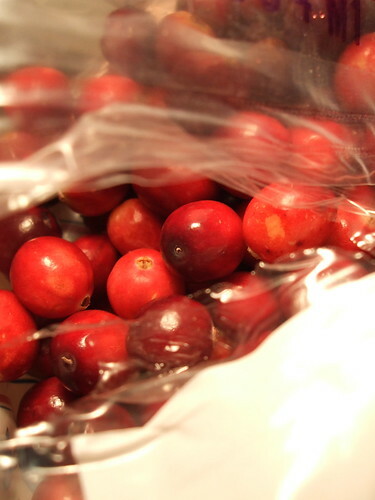 But, just in case you are still wondering what to do with those bags of cranberries, here’s a simple recipe the Chef just showed me how to make. In fact, our batch is cooling in the refrigerator right now. So you see — after 11 pm the night before? That’s not too late. Bring the orange juice and sugar to a boil. When it is rapidly boiling, add the cinnamon stick and cranberries. Turn the heat to low and stir the cranberries, constantly, at first. After ten minutes or so, the cranberries will start to pop and break down. Continue to stir, but a little less frequently now. Leave the pot uncovered to speed the process along. After about half an hour, the cranberries will have popped, released their liquid, and started to reduce. At this point, add the honey and the orange zest, then pour the mixture into a casserole dish and spread it all out to one layer. Refrigerate overnight. Makes enough for eight people. Use maple syrup instead of sugar (about one cup per bag) and it will be even better! It might be a bit close to Thanksgiving to make this but I’ll keep the recipe for Christmas, in fact my son loves it all year round. Adding brown sugar, cloves, allspice and raisins, as well as a squeeze of lemon is my variation.I kind of like it mincemeaty, without the minced meat, esp. for Christmas. Next year, I’ll give your recipe a try. Maybe we can get a little variety around our place. Love your blog, pictures and recipes. My brother-in-law has celiac and I got good inspiration from your site. Well, that’s an idea! I have to say, I like my cranberries rather tart, so I’m not sure if maple syrup would work for me. But I trust you, so I’ll have to try! I’m with your son. I could eat cranberry relish all through fall and winter. In fact, I think I will! I’ve never thought about making cranberries like mincemeat. It’s definitely worth a try. Well, I like to play with my food. If everything worked out perfectly the first time, where would be the joy in that? I’m so happy that the blog has helped. That’s why I’m here, after all. Pleaes tell your brother-in-law that I say happy eating to him. It’s good, and lest I forget, have you ever used cranberries to make homemade cranberry liqueur? A bit of spice, maybe orange peel and cinnamon, in that is nice too. It might be lovely to offer at the restaurant this season. You can probably soak the fruit in alchohol for a few weeks, then add a simple syrup and serve in time for Christmas, though longer soaking makes it better. Cook once, eat twice! I made a batch of this chutney for chicken earlier this week, but we never finished the chutney. So…I put it along with some frozen banana and juice in a smoothie and it’s wonderful and thick and great! YAY! I just made this chutney last night for Thanksgiving and it is fabulous!!! Although I’m not gluten intolerant, I have a dear friend who is so I’m making quite a few of the recommended recipes so she’ll be able to enjoy the entire meal. The only alteration I made was to use Splenda in place of sugar. (I also have a diabetic friend who will be attending dinner.) Thank you for all you do!